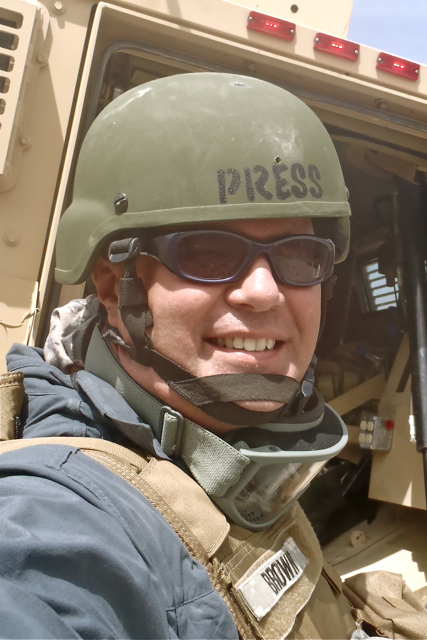 Freelance writer and citizen-soldier by day, and secret (writing as "Charlie Sherpa") blogger by night, Randy Brown was preparing in 2010 to deploy as the sole "knowledge manager" for an Iowa National Guard unit of 3,000 soldiers. ("Historian, librarian, lessons-learned reporter—it was sexier to say my job was 'Brigade Staff Jester,'" he jokes.) After a paperwork SNAFU dropped him off the list, he retired with 20 years of military service and a previous overseas deployment. He then went to Afghanistan anyway, embedding with his former colleagues as a civilian journalist. He continues to write about military topics at: www.redbullrising.com. Brown's often-humorous military-themed poetry and non-fiction have appeared widely in literary journals and anthologies. He was the 2015 winner of the inaugural Madigan Award for humorous military-themed writing, presented by Negative Capability Press, Mobile, Ala.
Brown was the 2012 winner of the Military Reporters and Editors' (M.R.E.) independent-blogging category, and a past finalist in the Milblogging.com awards' reporter (2011) and veteran (2012) categories. He is the current poetry editor of Military Experience & the Arts’ literary journal "As You Were."